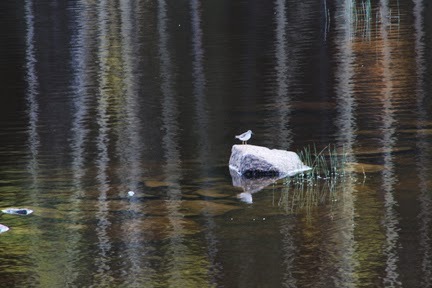 This little bird was kind enough to pose on a rock at the edge of a lake on Grand Mesa. I liked how the bird and big rock contrasted with the water and I thought the squiggly reflection lines added nice interest. Enough is enough; he flew away soon after I snapped the photo. Never mind that I was hoping to take another shot. But I'm happy with this one.